What a year 2016 has been for Old Friends! We continue to grow, and this year, thanks to our generous and far-sighted supporters, we have recovered and improved our barn facilities and met significant goals toward providing our increased roster with more paddock space. The care they’re getting has never been better. There’s no feeling more wonderful than walking a farm full of happy horses. Inevitably, some much-loved residents passed in 2016, who we’ll always miss. As life goes on, new residents make their own places in our hearts –Little Mike and big-personality Ide, to name just two. 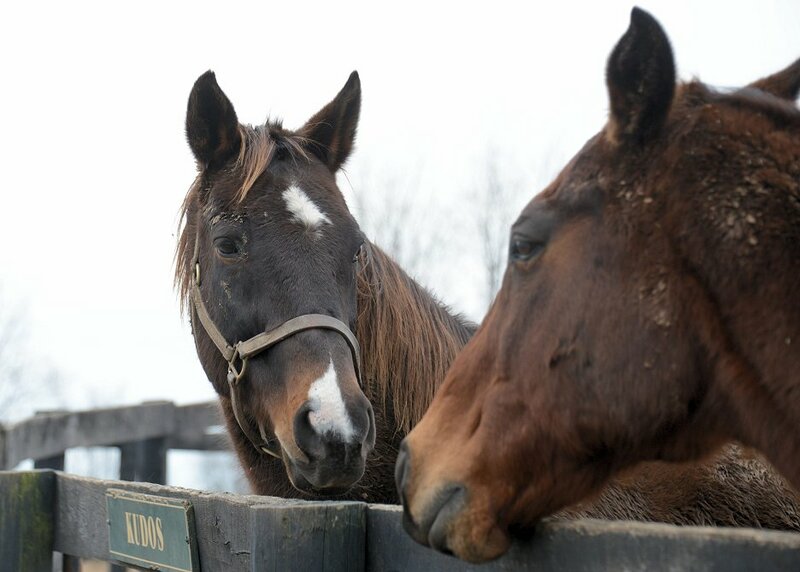 In becoming home to Charismatic, Old Friends has achieved one of its original goals and we’re pleased to deepen our valued relationship with the organizations in Japan that provided such excellent care at stud to Charismatic (JBBA’s Shizunai Stallion Station), War Emblem (Shadai Stallion Station), and Silver Charm (JBBA’s Stallion Stations). We’re also honored that Old Friends’ retirees played host to a record-breaking 10,000+ visitors in 2016. Counted in numbers of carrots enjoyed, it’s been a great year. 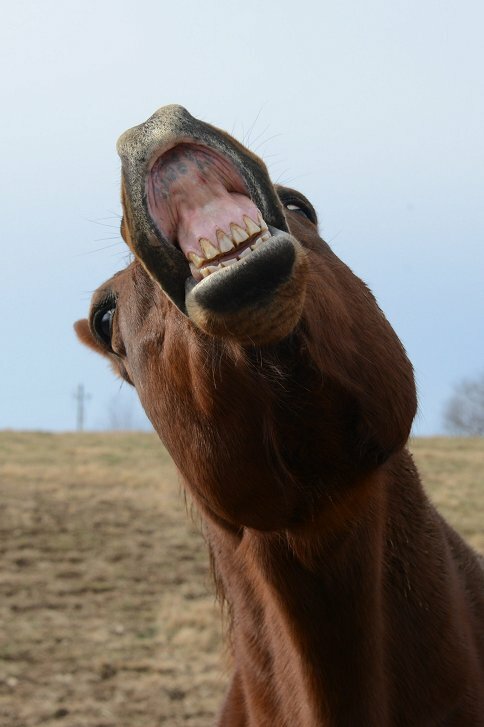 Now, once again, it’s that time of the year when we tour guides try to remember to add a year to every horse’s age. Here are some landmarks. 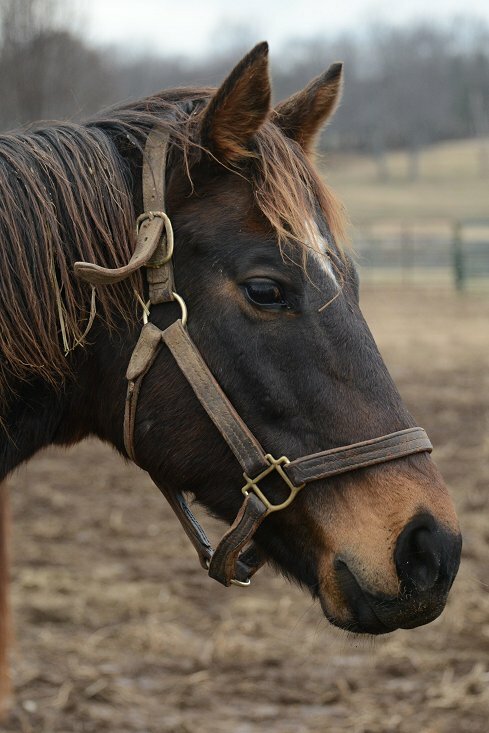 Dinard, our oldest Thoroughbred, will be 29. Officially, at least. 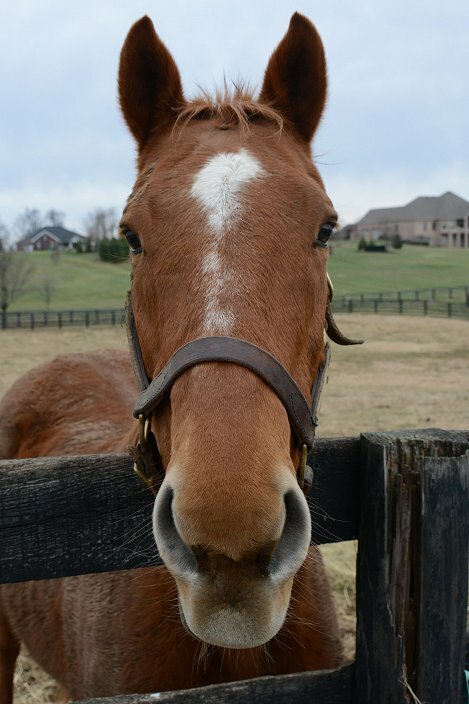 He was foaled April 6, 1988. Our next most senior, Swan’s Way, Silver Ray and Highland Ack, each turn 28. At Cabin Creek, Will’s Way has seniority at 24, and at Kentucky Downs, Thornfield will officially be 21. In Georgetown, so will Charismatic, of course. Silver Charm and Touch Gold will be 23, and War Emblem and Sarava are a youthful 18. “Hrm!” I feel a hoof tap my back. 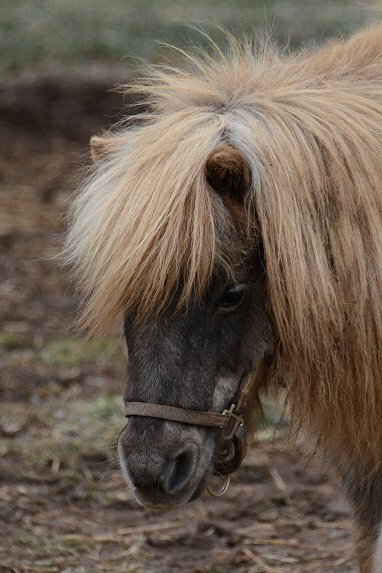 Because it’s Little Silver Charm who really has seniority over all the horses at Old Friends. We just don’t know exactly how old he is. He’s not telling, but he does want his status duly recognized. The ones whose ages I can hardly wrap my head around are the new twenties, Special Ring, Kudos and Judge’s Case. Ringy, 20 years old? Seems impossible. Wasn’t that just yesterday he arrived all fiesty at Hurstland, a 9 year old kid with a big notion of himself—deservedly, since he’s a multiple G1 winner with earnings of nearly $1 million—and just yesterday that he adopted Popcorn Deelites with the attitude that he could push Pops around all he liked but he’d protect him with his last breath if it came to it? Ring and Pops have settled into an easy, kind companionship over the years. Pops (19) always feels secure under Ring’s (20) protective supervision. Under Ring’s bossy, protective eye, Pops continues to flourish. He’s turning 19, himself. Derby winners competing for carrots make no difference to this star team. They’ve got their act down solid. Time to confess, though. When Special Ring is off stage, he’s one of the most sensible horses on the farm. Of course, it’s obvious at all times that he’s smart. Who else on the farm gets a carrot just by lifting a lip? Other decaders at the main farm are Game On Dude, Little Mike, Yankee Fourtune, Sarbonne and Fergus Mac Roich, all hitting the big 10. Game On Dude will really be 10? Such a cool Dude. Yankee Fourtune (10) whispers a secret to Bonapaw (21). Of course I’m a perfect 10. Sarbonne. All of us at Old Friends, horse and human, warmly wish everyone a 2017 of peace, kindness and love. Happy New Year from Maybesomaybenot (9), Bobby Sands (12), Areyoutalkintome (16), Shadow Caster (21), and all the rest of us. Here’s a short clip from WLEX, Channel 18 in Lexington, from Charismatic’s press conference yesterday. 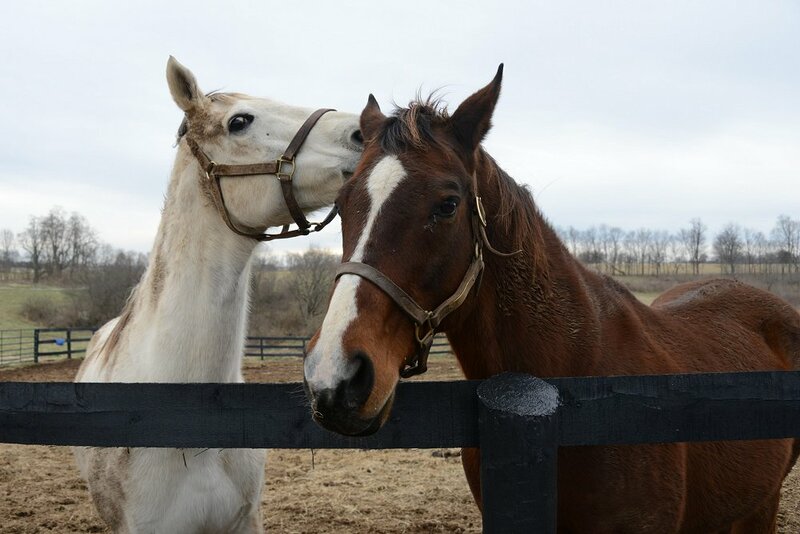 Considering Silver Charm’s obvious disapproval of the attention lavished on the newcomer to the farm, the two Kentucky Derby winners are working out a neighborly ease with each other. Yesterday afternoon Laura captured this interaction between them. It may seem as if horses in two different paddocks have little contact with each other, but watching stallions who are too territorial to share a paddock interact over their fences makes it clear how much socializing they actually share. Eye contact, body language, and occasional vocal signals communicate a lot. I’m sure we humans miss a good deal of it, but we notice that certain stallions tend to graze each in his own territory but close to each other, others ignore each other, and some enjoy razzing each other. Awad and Kiri’s Clown, rivals on the track, ran elaborate disrespect numbers at each other but usually hung out side by side and if one went to the barn the other would call out for him. Mixed Pleasure was the only horse on the farm who could get a gallop out of the usually unflappable Clever Allemont. Alphabet Soup is popular. Depending on which side of his paddock he’s on, either Geri or Ide will usually be found nearby. It looks as if 1997 Derby and Preakness winner Silver Charm and 1999 Derby and Preakness winner Charismatic are in the process of working out a pretty neighborly understanding. 2002 Derby and Preakness winner War Emblem isn’t their neighbor, but he’s on friendly terms with Eldaafer in the paddock behind him. And of course he, too, has plenty of human admirers. As you can see, he has Michael in training. Anyone for a future wager on Michael? Today we had the first snow of the winter. It was only a sprinkling, but it was enough to make the ground white for a few hours. Here’s my first snow of the winter haiku. Eyes bright, muscles strong—such care! By the time I got to the farm the snow was gone, so there’s no illustration. 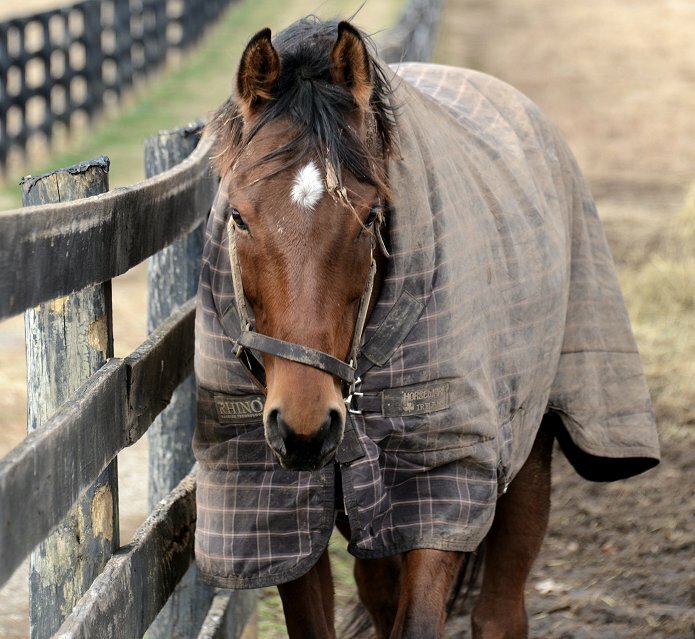 Charismatic is comfortable and relaxed in his warm blanket. With his stall’s back access door open to his paddock he has his choice whether to be indoors or outdoors and has preferred to spend the day outdoors. And, again, I’d also like to thank the Robert and Beverly Lewis Family Foundation, Tito’s Handmade Vodka, and all who are contributing toward Charismatic’s safe journey and smooth transition into retirement. Hope to see you at Charismatic’s welcome home press conference this Monday, Dec. 12, at 1:00 pm! 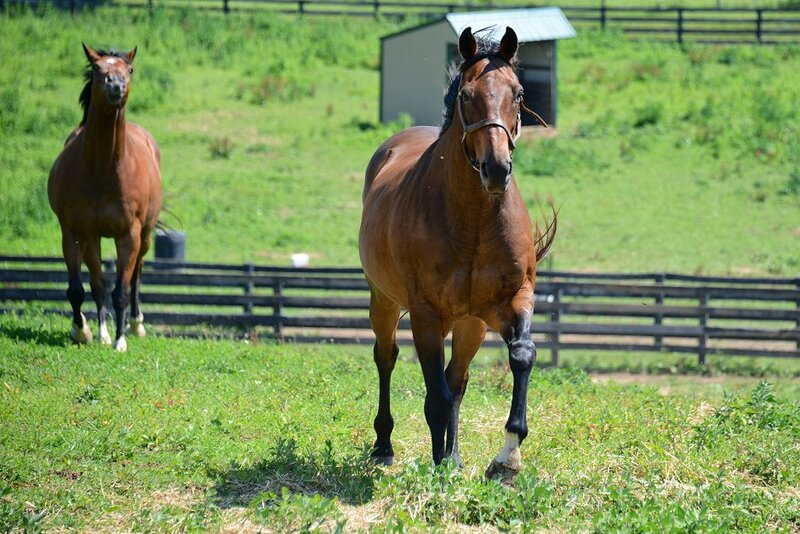 No particular news except that today was Charismatic’s first sunny day at Old Friends. Each time he goes out in his paddock he’s more relaxed than the day before as his surroundings grow familiar. Though these are just snapshots, I couldn’t resist posting the morning light shining on his bright chestnut face. For the horses, a sunny, not too cold, winter day with no demands and no one working – except for the humans who are busy seeing to their comforts – is a day of lazy pleasure. It always amazes me how contentedly horses can sunbathe in even the coolest sun. Silver Charm was grazing broadside to the warmth, Afternoon Deelites no longer feels any need to impress (at least for the moment) and was all but snoring, and Little Silver Charm…somewhere between awake and snoozing, I think. Stay tuned for more thrilling snoring, sunbathing and grazing. Here are some much better pics from yesterday, with many thanks to the tireless Laura Battles. Did I say trot? Wow, look at this floating pace, too. Move over, Dan Patch! Afternoon Deelites has a ready answer. All 4 off the ground! Though the horses around him were more interesting than the people, he came over for a little while to say hello. Silver Charm, in the paddock next to all the action, let us know he was NOT impressed. (He also wants you to notice that Barbara L is NOT pointing her camera at HIM.) 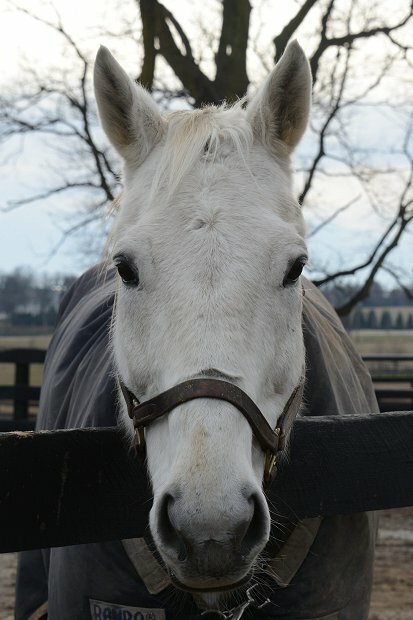 Silver Charm: always dignified even in exasperation. D. Wayne Lukas looks his former trainee over. And approves. 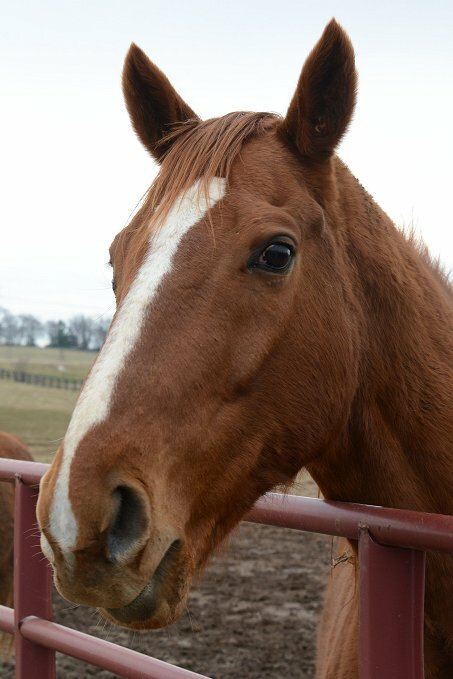 The horses who’ve come to us from both JBBA and Shadai Stallion Station have all returned in admirable condition. More about Charismatic’s settling in will come soon. Do I like this horse? You might say so. What a day it’s been! At 9:00 a.m. Charismatic was turned out for his first look at the farm and a chance to stretch his legs. He looked noticeably rested and took in his surroundings with alert curiosity. As he swung into a trot a collective ahh! went up from all of us. What a surprisingly gorgeous, floating, extended trot this horse does on those flashy white-stockinged legs! A winged Pegasus trot, barely skimming the ground! It was an overcast morning and neither my camera or I are great at photography. This is the nearest I came to capturing that trot. Of course, all the intriguing smells in a new paddock must be investigated immediately. He spent much of his morning introducing himself to the interesting personalities around him. Not the humans. The really interesting ones–the horses. Charismatic meets Fighting City Hall and Danthebluegrassman. So, what about that big guy over on the other side of his new digs? Afternoon Deelites: Who do you think you are, new kid in town? I ran in the Kentucky Derby. Charismatic: Oh really? I won the Kentucky Derby. The highlight of the morning, one of the biggest highlights of any morning, ever, at Old Friends, was the welcome-back visit paid by Charismatic’s trainer, D. Wayne Lukas. The Hall of Famer remarked on how good Charismatic looks, and on his excellent muscle tone. “He looks exactly the same,” he kept saying happily. A long awaited reunion – Charismatic and D. Wayne Lukas. Photo by Laura Battles. Mr. Lukas also delivered the Charismatic’s Inner Circle certificates he has generously autographed–all 300 of them, and recounted stories of Charismatic’s racing days. While he and Charismatic spent some time together I found myself standing next to Dr. Waldridge, who said he’s pleased with the preliminary exam. In the next few days these will be followed up by the full exams and recommendations that all Old Friends’ new retirees receive. The barn staff reports that Charismatic has been drinking a good amount of water–important after travels for maintaining a horse’s health. For more (and better) pictures, see @oldfriendsfarm on Twitter and check out Barbara Livingston’s gorgeous photo of that extended trot on Facebook. Now there’s a photo that does that trot of his justice! Here are some of Laura’s photos of Charismatic’s arrival at Old Friends last night. 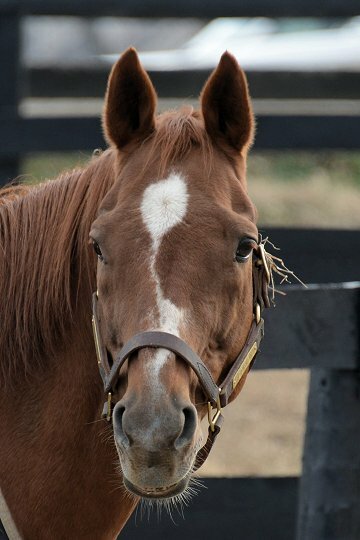 Wonderful to have you back in Kentucky, Charismatic. More soon. How’s this for a photo of that stall? Charismatic arrived at the farm a little after dark this evening. The available light didn’t make for the easiest photography conditions, but I call this one beautiful sight. 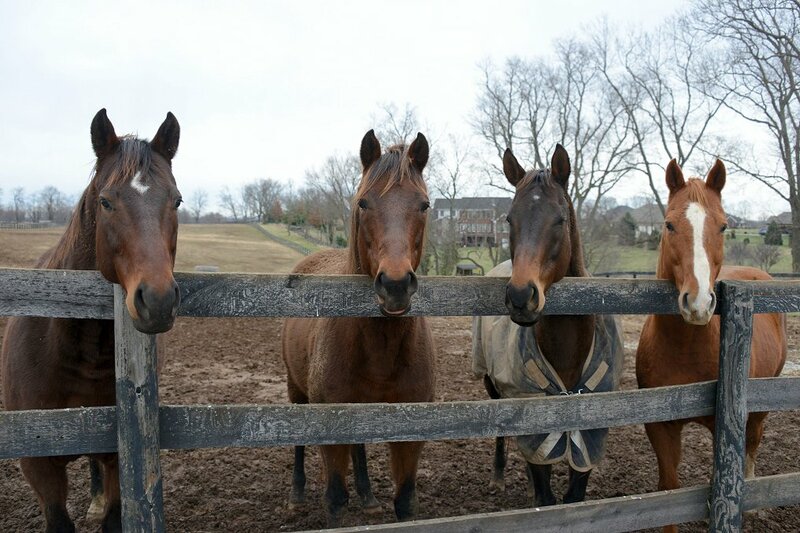 The 1999 Kentucky Derby and Preakness winner, now 20 years old, was welcomed briefly by Old Friends staff and our vet in residence, Dr. Bryan Waldridge. After a few photos and preliminary checks he was allowed the quiet to settle into his new quarters where, hopefully, he will enjoy a sound night’s sleep. 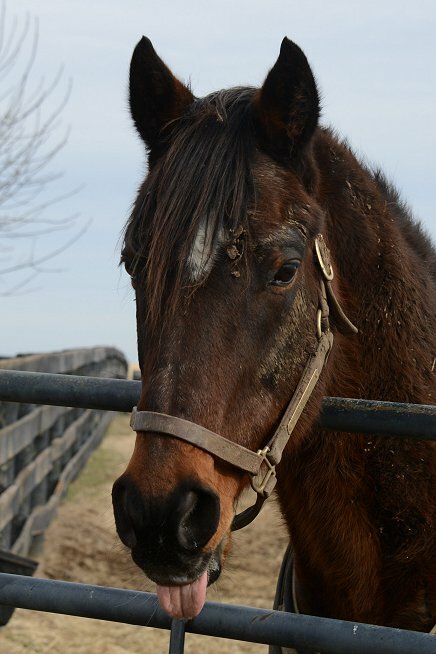 @DRFLivingston on Twitter for a few more of Barbara Livingston’s photos of his arrival and check @Oldfriendsfarm for news flashes about Charismatic during his quarantine. 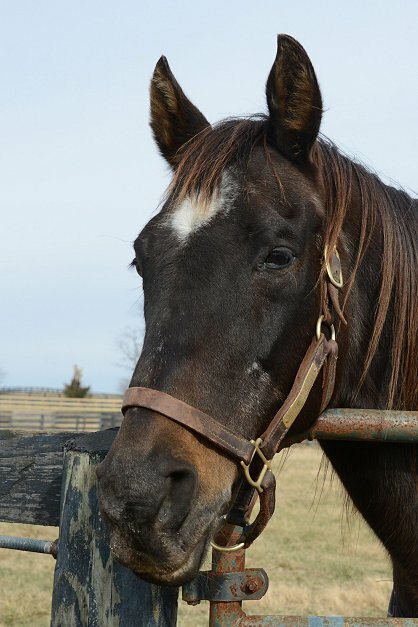 As soon as Michael sets a date and time for his Welcome gathering, you’ll find that information at @Oldfriendsfarm on Twitter. More to come here as he settles in and we begin to get to know him. Here in Georgetown we’re all settling into our own versions of hay and soft bedding with big smiles on our faces. Well. I promised a photographic look at our fantastic new quarantine quarters. So yesterday I diligently snip-snapped away with my camera. I took pictures of the stall that will be Charismatic’s, the bedding, the facilities for feed, hay, water, the spacious paddock he’ll be able to access at will. Proud of myself, I buzzed home to download them. Urgh! where’s my usb cord? Nowhere! The comedy of errors continued today when Sylvia kindly loaned me a cable with what looked like the right connection. You guessed it. Not. So I’ll do my best to describe what the photos still stuck on my camera would have shown. First, the barn. If you haven’t seen our new barn, it’s amazing. Its design benefits from our staff’s and vets’ collaborative thinking and experience to make it the safest, most secure and pleasant environment a horse can enjoy. The stalls are big, the floors easy on the feet beneath the plentiful bedding, the atmosphere is airy and well lit–by day the wood and soft, plentiful daylight give the place a mellow glow. Old Friends is grateful to Fasig Tipton’s Blue Horse Charities and the other donors who made this barn a reality. 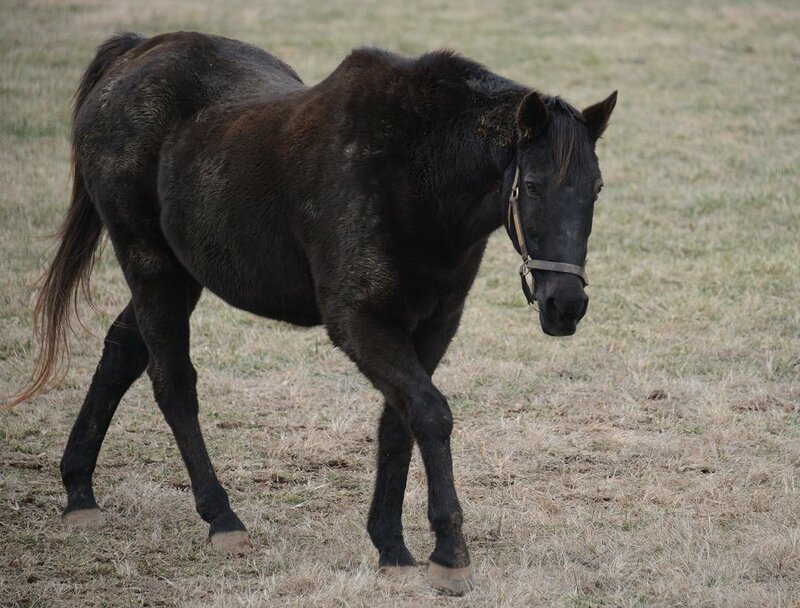 Besides the front door opening to the barn aisle, Charismatic’s stall has another door opening onto a paddock big enough for him to run around a bit, graze on the winter grass, sun himself on mild days, and get accustomed to his surroundings. Double fencing will make sure quarantine is maintained and that a buffer of peace and quiet surrounds him as he gets used to the doings at Old Friends. When this back door between his stall and barn are open he can choose freely whether he’d rather be in his paddock or go into the shelter of his stall where his best of hay and fresh water are always available and where he’ll be served his breakfasts and dinners. Talk about a luxury suite! And of course, in quarantine doesn’t mean lonely. 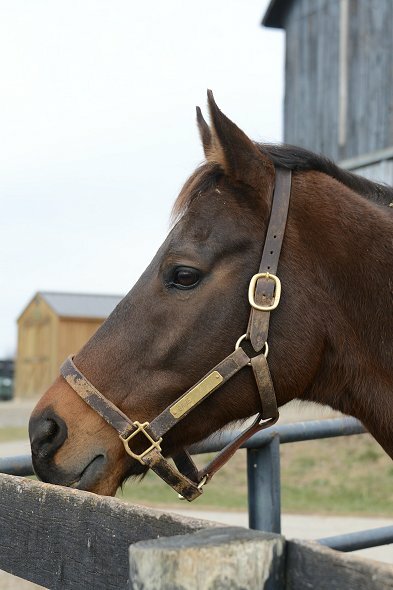 He’ll have hands-on care from Old Friends staff who will carefully follow the procedures required by the government, the Thoroughbred Aftercare Alliance, and our barn management in consultation with Resident Veterinarian, Dr. Waldridge. For a horse transitioning from the relatively private life of a stallion at stud to the popularity of a celebrity at Old Friends, this intermediate stage will help him get to know and trust those who will be the core of his support staff in his new life. He’ll feel loved. Ide, generously donated to OF this year by Clear Creek Farm, Louisiana. Behind him are the back doors giving the quarantine stall and other stalls access to outdoor paddocks (located beyond the right edge of the photo). This is Ide (Forty Niner-Maytide by Naskra), winner of the 1996 Rebel Stakes, who came to live with us this year (isn’t he gorgeous?). Behind him are the row of back doors I’m talking about. They lead into various paddocks and runs providing outdoors access from stalls when the doors are open. I took several pictures of the spacious area Charismatic will use. Oh well,it’ll look even more impressive before long anyway.